I'm catching up on Mad Men by watching the first season on DVD. I find the show's atmosphere amazing, both in terms of the characters at the ad agency and the 1960 setting they inhabit. I can't recall a TV series where the sets have been so immaculately well-designed. The offices, bars, apartments and homes are so engrossing that at times I wish the characters would get out of the way so I could see them better. Part of the appeal is nostalgia. When I was a young child in the early '70s my mother worked in Dallas as a secretary for the ad agency TracyLocke, and my recollection of visits there matches the look of Sterling Cooper. My memories are more pleasant than hers, since I didn't have to work there. One of the workers kept a bowl of SweeTarts fully stocked at his desk, and every visit I'd make sure to hit that bowl at least twice for everything I could carry. Instead of burning through the episodes like a junkie, as I did recently with Weeds, I'm going to take my time with Mad Men. 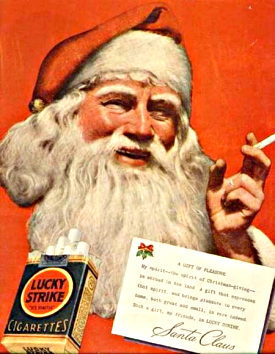 "Smoke Gets In Your Eyes," the pilot episode, begins with senior ad man Donald Draper struggling to come up with a new campaign for Lucky Strike cigarettes. The government has begun cracking down on tobacco companies that make bogus health claims in their advertising, just as the risks of lung cancer to smokers are becoming a major public concern. Reader's Digest is mentioned during the episode because of an article scaring people about smoking. A detailed synopsis on TV.Com reveals that the show refers to a real article, "The Growing Horror of Lung Cancer," that appeared in March 1959. Of 100 people who get lung cancer today, the physician told him, 45 will be inoperable by the time they consult a doctor, their cancer so widespread that surgery will be futile. Chests of the remaining 55 will be opened. This is drastic surgery and as many as 11 of the 55 patients may die of it. Inspection of the chest cavity will often give clear evidence of cancer spread, possibly even to the heart itself. In such cases the surgeon may leave the lung untouched and simply close the wound. These patients -- perhaps 12 -- will be dead in a few months. By now the original 100 has dwindled to 32 patients who are operable. The surgeon removes all or part of the diseased lung and prays that no cancer seeds have been left behind. But in a distressingly large percentage of cases, clusters of these cells lurk in hidden recesses, to continue their growth. According to present statistics, only 5 of the 32 patients who survive the operation will be alive -- and presumably cured -- at the end of five years. Thus the score stands: 5 survivors out of 100 victims. The article, which makes one smoker's pneumonectomy surgery sound nightmarishly medieval, is a pretty amazing read with five decades of hindsight. Heavy smokers were learning for the first time that they faced a high likelihood of lung cancer. A few years ago, lung cancer was a medical problem of no consequence. A survey of world medical literature in 1912 showed a total of only 347 cases reported. Today annual deaths are measured by the tens of thousands. Tomorrow? "It frightens me to think of what is going to happen in another decade when our present smoking habits catch up to us," says Dr. Ochsner. Ochsner was Alton Ochsner, a famous surgeon whose clinic was one of the first to link cancer and cigarettes. As a young medical intern in the '20s he was once invited to witness a lung surgery operation on the grounds he might never see one again. He didn't for another 17 years, but then began getting numerous cases of World War I vets who had taken up smoking as young men. Decades after the health risks of smoking became crystal clear, lung cancer continues to kill 1.1 million people a year, thanks in part to generations of ad execs like the protagonists of Mad Men. Man's inhumanity toward his fellow man is obvious in the efforts to blame tobacco, and those involved in its use, for Lung Cancer. The "statistical" link between potato use and lung cancer, is certainly more evident than is tobacco use. Indeed, the human tendency towards stupidity is revealed in that "science/medicine" completely ignores All other dangerous emissions in our environment; in order to Hate tobacco and those who are involved in its use. Gasoline and diesel oil (car, truck, plane, etc.) as carcinogens is Way beyond that of tobacco smoke! However, the various minions of hate ignore it like the slavish personalities they just happen to be! You sound like one of the tobacco executives in the episode. The scientific basis for the link between smoking and lung cancer is beyond dispute. Cigarette smoking causes 87 percent of all lung cancer deaths, according to the National Cancer Institute, citing its study "SEER Cancer Statistics Review, 1975"2001." Perhaps gas and oil are just as carcinogenic to lungs, but we haven't created products that enable people to inhale these fumes during every waking moment of their lives. Rogers replies, "You sound like one of the tobacco executives in the episode." Rogers demonstrates the point, "The scientific basis for the link between smoking and lung cancer is beyond dispute." So is the link between baked potato consumption and lung cancer, but more so! You pretend that statistical analysis is some sort of cause-and-effect "fact" which "proves" your contention; i.e., that tobacco smoke causes lung cancer. That sort of self-blinkered understanding is exactly the attitude I meant; my point. Indeed, and since the occurence of lung cancer is ONLY statistically greater for tobacco smokers than it is for non-smokers, the tobacco bigots have to infer (read: lie like the creeps they are) second-hand smoke is causing non-smokers to get cancer! As mentioned, automobile/truck/plane/lawnmower (ad nauseam) exhaust is orders more carcinogenic than has been proven about tobacco! Yet, only tobacco is singled-out for demonization and its users dehumanized - not the omnipresent exhaust that pollutes *EVERYONE'S* air 24 hours a day, day after day, year after year ... and who benefits from erecting scarecrows to allow US to continue killing future generations for the convenience of the automobile? Lawyers, insurance companies, state governments and special interests ... not the "victims" of the internal combustion engines (90% of lung cancers,) "evil" tobacco (9% greater chance of lung cancer,) or the lowly baked potato (less than 1% among other statistically stupid causes,) ... and maybe anyone ever exposed to some cleaning product or another, like the potentially "evil" glycerine soap!?! Rogers gets mathematical, "Cigarette smoking causes 87 percent of all lung cancer deaths, according to the National Cancer Institute, citing its study 'SEER Cancer Statistics Review, 1975-2001.'" I actually dote on such misrepresentations. Who is it that survives "death" in this universe? Certainly not any human being; including the vaunted Christian example! So, who is it that is surviving "death" with lung cancer? No one, except that this "statistics" is invented (see post script) to support their self-interested propaganda - they make gelt from attacking "evil" tobacco. Aren't you even a bit embarrassed at being duped, politically, in this way? Rogers gets logical, "Perhaps gas and oil are just as carcinogenic to lungs, but we haven't created products that enable people to inhale these fumes during every waking moment of their lives." Unreal! I have no trouble admitting that tobacco is bad for your health, or that it contributes to an individual's chances in getting lung cancer. I'm not a smoker, or in the pay of the tobacco interests (certainly not Al Gore's tobacco wealth and ownership!) However, you belittle an *obvious* fact with your "perhaps," and attempt to dismiss it with an obvious lie; if not just a stupid slip of a pre-Alzheimer's moment ... or do you benefit from eliciting prejudice against tobacco and, or tobacco users? ... and how is it that you manage not to breath exhaust fumes all the time. Do you manage to filter the city/urban air in your surroundings, and where all the efforts of the US government and states have failed to get rid of the exhaust pollution??? PS: Statistics are always interesting - if it is kept in mind that they are not "facts". For instance Lung Cancer statistics show that this form of cancer (both large and small cell) is the leading cause of death in both men and women. Other statistics demonstrate that the NCI stats you provided are obviously misrepresented. Tobacco smoke exacerbates the conditions that lead to death and the stats are meant to show that 87% of smokers die sooner than their non-smoking contemporaies/peers when the cause is lung cancer. Other statistics more than demonstrate that smokers have a greater rate of getting lung cancer - but that they are only a relatively small increase when measured against all lung cancers AND in comparison to the total population. Overall, the chance that a man will develop lung cancer in his lifetime is about 1 in 13; for a woman, the risk is about 1 in 16. These numbers include both smokers and non-smokers. For smokers the risk is much higher, while for non-smokers the risk is lower. I miss those candy/gum ciagrettes we got in the 70's. You can still get 'em at oldtimecandy dotcom! This is a perfect example of Liberals artistically tar-and-feathering the target of the moment, and before they run the evil entity out-of-town on their democratic railroad. It is, of course, a monumental failure! More teenagers smoke now, than before the ban on the evil candy cigarettes! If we followed the liberal logic (defining the term 'oxymoronic') then the collective 'We' should ban evil Liberal Banning, because it has increased the use of tobacco by teenagers! Progress, far from consisting in change, depends on retentiveness. When change is absolute there remains no being to improve and no direction is set for possible improvement: and when experience is not retained, as among savages, infancy is perpetual. Those who cannot remember the past are condemned to repeat it. In the first stage of life the mind is frivolous and easily distracted, it misses progress by failing in consecutiveness and persistence. This is the condition of children and barbarians, in which instinct has learned nothing from experience. I've seen them at candy stores in St. Augustine as well. Selling kids candy in the shape of cigarettes is repulsive. I'm glad it's not commonplace any more. Rogers says, "Selling kids candy in the shape of cigarettes is repulsive." That certainly is Christianish of you, Rogers; even Mormonish, if you consider that religion seperate from Chritianity. I'm sure you are sincerely concerned about the health influence that such public demonstrations of 'support' hope to forfend. Ironically, leftism turns a blind eye to the vast increase in health problems which their support of homosexuality means to future generations of children. Indeed, that support is really a facade, a beard for propagandistic efforts to gain political power from every minority the party can hope to bribe into supporting them. If it weren't, then their effort to turn candy cigarettes into an icon of endangered health for children is a gigantic hypocrisy, and when the same party turns a blind eye to the potentially more dangerous health practice of homosexuality; epidemic possibilities and early death as a stark reality of some of their 'repulsive' practices. Mad Men ought to be slapped with an R rating. The whole show appears to be a cynical attempt by Big Tobacco to recommence their genocide. The blog post is really written well. Thanks for sharing.